Why not treat yourself with a nice piece of crumbly cheese. 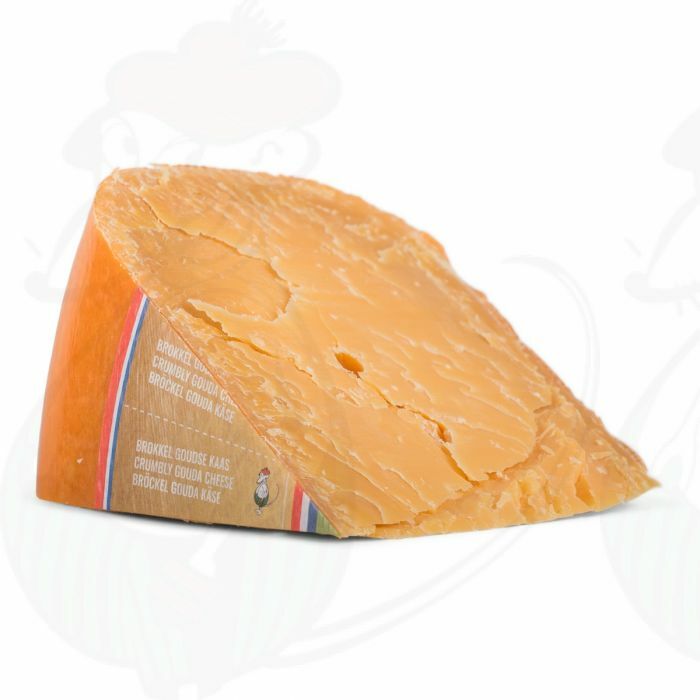 This Gouda cheese variant is strong, spicy and nutty in flavour and larded with crispy salt crystals. Why not treat yourself with a nice piece of crumbly cheese. This Gouda cheese variant is strong, spicy and nutty in flavour and larded with crispy salt crystals. Crumbly cheese is a very old cheese that has a maturation period of no less than 3 to 4 years. Tastes especially delicious in combination with a good glass of red wine or a dark trappist beer or abbey beer. The ideal romantic evening is incomplete without a good piece of crumbly cheese. Gouda cheese is one of the most popular cheeses in the world. Unfortunately, the name Gouda cheese is not protected, so the term is not restricted to cheese from Dutch origin alone. However, when a cheese is labelled 'Gouda Holland', this is the original Dutch Gouda cheese. Of course, this is also the cheese we sell in our shop. We have Gouda cheese on offer of different maturation, ranging from young cheese (matured 4 weeks) to very old crumbly cheese (aged 3 or 4 years).